St. Bernard To the Rescue? Once upon a time, many decades, if not centuries ago, the Monastic Orders in the Swiss Alps used trained St. Bernard dogs to assist in the rescue of endangered travelers. Today, if public opinion polls and journalistic puff pieces are any indication, we are in for an encore performance of St. Bernard to the rescue. This time, however, the beneficiary of the assistance will be the national Democratic Party, and the new St. Bernard will be Bernard of Burlington via Brooklyn, the inimitable Senator Bernie Sanders, D-Vermont. The national media took a break last week from celebrating Bill O’Reilly’s fall and mocking President Trump’s allegedly meager accomplishments during his first three months in office. They centered, instead, upon the Democratic Party and its attempt to rebound from their historic, unexpected, and quite embarrassing loss last November 8. Much of the current commentary, as chronicled in these pages on Townhall, note the rough reception accorded to Tom Perez, the new DNC Chairman, on the so-called Democratic unity tour. Perez was jeered in Maine, booed in Florida, and heckled in Utah. His reception likely brought back memories of the ever-popular Jimmy Carter, and the halcyon days of the late 1970s. As Mr. Perez flounders, however, Senator Sanders waits in the wings, hoping for his moment, and many Democrats are with him. Yes, Bernie Sanders, who refuses to call himself a Democrat, has emerged as the most popular man in the Party, and might even be tabbed as the Democratic front-runner for the hopefully far-off 2020 election. What is it about Bernie Sanders that delights, even thrills his throng of admirers? Certainly, the Senator’s drawbacks and liabilities are many. He is 75 years of age, quite a senior citizen by any standard of measurement. Many observers have noted that Senator Sanders also allows his temper to get the better of him, and that his irascible nature is somewhat unsettling. Finally, Senator Sanders's devotion to socialism, both in the theoretical and practical realm, might prove a tough sell to a nation that has historically had little use for the ideology. Well, when we look closer at the weaknesses, we see that they aren’t insurmountable obstacles. President Ronald Reagan, in addition to his other myriad accomplishments, proved that a septuagenarian could handle the rigors of the presidency. In fact, it does seem rather quaint today to think that political figures pushing the 70-year mark would be considered too old for the job. When we reflect on the fact that President Trump is 70, and his former challenger, Hillary Clinton will celebrate that milestone birthday this October, we have to admit that the game has changed. We might further reflect on the fact that most of the Democratic bench, like Nancy Pelosi, Joe Biden, Elizabeth Warren, and Chuck Schumer are all past social security eligibility age. Certainly, Senator Sanders may be pushing things, but he can expect a pass on the age issue from the media. Sanders's irascible nature might be a hindrance, so his packagers will very likely try to turn a negative into a positive. They will portray him as a lovable, if somewhat curmudgeonly grandfather-like figure, who hides his heart of gold underneath a shell. The fact is, however, that Bernie Sanders is a cantankerous man who often uses a razor-sharp tongue to silence his opponents. This might play poorly on the national stage. The third liability, namely socialism, might be the hardest square to circle for the Sanders acolytes. They may try to face this openly, but it is more likely that while Bernie claims to be a socialist, his Party will deny this reality behind a cascade of obfuscation, and mental calisthenics concerning the nature of socialism today. 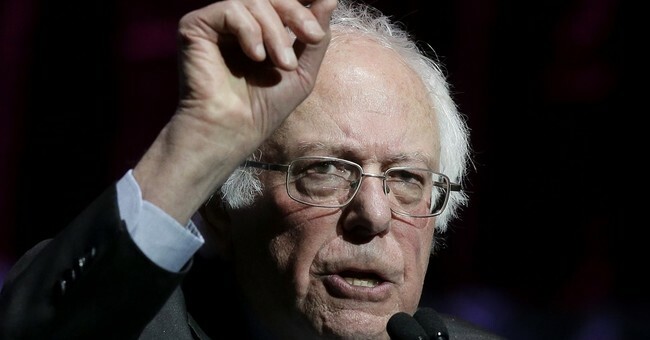 Many academics ignored Sanders' stated declaration at Georgetown University in the Fall of 2015 that he considered himself a democratic socialist, and an admirer of the Scandinavian-Nordic system. They have claimed that the Senator is actually something of a 1950s liberal of the Hubert Humphrey sort. Professor Noam Chomsky has said that Sanders, despite his protestations to the contrary, is actually an “honest New Dealer”. Maybe, but one must not put too much stock in what one liberal might call other liberals. We must remember, after all, that liberals told us that Castro, and later the Sandinistas were not Marxist-Leninists, but simple agrarian reformers. Whether he is a socialist or not, Sanders has built a following on the far left wing of the Democratic Party. His stump speeches consist largely of platitudes such as equality, evil financial institutions, and much bigger government. When pressed on specifics, the Senator tosses bouquets in the direction of student loan forgiveness, free college, a $15.00 per hour minimum wage, single payer health care, and a vague call to banking reform, forgetting that the single accomplishment of the Sarbanes-Oxley bill, the last major banking reform bill of 2002, was to allow London to replace New York as the world’s financial capital. Sanders promises that this will be paid for by a special tax on millionaires, never mind that he is promising hundreds of billions in new spending. When this is mentioned in question-and-answer periods the person who brings it up is usually subjected to a diatribe of class hatred and abuse. So, the Democrats need someone to take them back to the Promised Land, also known as the White House. They seem to be settling on Senator Bernie Sanders as the man for the job. Senator Sanders, with his many real liabilities may seem more of a Don Quixote, than a Moses. But, who, in 2013 would have predicted a President Donald J. Trump?